Women’s tennis is growing leaps and bounds as a sport as well as a commercial brand. Yet India is witnessing dwindling support for the sport, even though women tennis players are not only the most popular sportswomen on the planet but also the most prominent global icons for sports-male or female. Who wouldn’t recognise the names Martina Navratilova, Steffi Graf, Serena Williams or Maria Sharapova at the drop of a hat? Even India has a global iconic name to boast of in the form of Sania Mirza. More than a decade ago when a young Hyderabadi girl burst on to the international tennis scene with a heavy forehand and an overall aggressive tennis game, the world took notice and India did too. Fresh from winning the junior doubles’ title at Wimbledon, Sania soon followed up with her first Women’s Tennis Association (WTA) title at a tournament held at Hyderabad in 2005. She followed that victory with several deep runs at the biggest tennis tournaments including the four grand slams. Sania’s ascent in singles’ tennis was coincided by many WTA tournaments being held throughout that decade in various Indian cities such as Bangalore, Kolkata and of course Hyderabad. Some of the biggest names in tennis participated in these events like Serena and Venus Williams, Martina Hingis and Anastasia Myskina among others. A decade later a lot has changed. Sania switched from singles to doubles exclusively mainly due to a persistent injury and the various tennis events which had begun to dot the Indian tennis calendar slowly faded away. At present there are no WTA tennis events held in the entire South Asian subcontinent region. While WTA which organises and conducts all the affairs of women’s tennis, including tournaments all over the world as well as maintaining rankings of players, has expanded the world over, it has only receded in India. This year there are tournaments being held in 37 different countries throughout the year organised by WTA. Out of these 10 countries belong to Asia. China alone is hosting seven tournaments, only two behind the world leader USA. India, which is considered a fast growing economy and an emerging market for all things under the sky does not feature in this list. It is not as though no tennis tournaments are organised at the highest level in the country. Association of Tennis Professionals (ATP) the male counterpart of WTA has been organising the sole tennis tournament of the South Asian subcontinent at Chennai every year for more than two decades. The tournament has hosted and continues to host some of the most successful names in men’s tennis such as Carlos Moya, Rafael Nadal, Stanislas Wawrinka, Marin Cilic and many more. Indian talent Somdev Devvarman has in the past reached the final of the tournament and young rising stars such as Yuki Bhambri and Ramkumar Ramanathan have made names for themselves in the singles’ event as well. These players have also been given wildcards in the past in the tournament which has allowed them to increase their ranking points and improve their standing which further help them qualify for bigger tournaments. 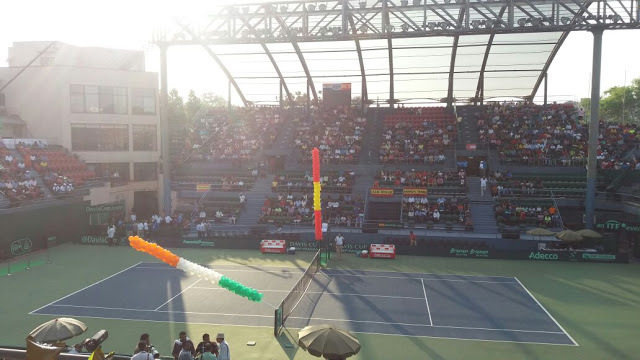 At the same time many tennis fans in India get an opportunity to bear witness to the performance and talent of these players and inspire future players to take up the sport. Unfortunately for women players same opportunities are not presented in India itself. While it is true that Indian women are ranked outside of the world’s 200 in the international rankings but such events allow them to participate in big tournaments where they might have the chance to play against and witness higher ranked players who are global superstars in tennis. Even for younger girls, there are no big ticket events to witness tennis stars or their compatriots in action and are therefore less likely to be inspired to pick up the tennis racquet. If this was not enough, witnessing WTA events have become even harder. Since the start of this year, those who might have noticed there have been no WTA events being broadcasted on any Indian television sport channel. Till last year these events from quarterfinal stage onward and the last round robin matches onward for WTA finals were telecasted on Ten Sports. As that contract expired in 2016, no new channel has picked up the WTA events as yet. WTA was contacted regarding this development but no response was received from them. This means that India is in a rare company of countries not showing any women tennis players competing in WTA events. A total of 164 countries have access to WTA events’ broadcast but none in the South Asian subcontinent do. This is also concerning since women in sports in this region are already few and far between. Thus while sports fans are getting to watch all kind of sporting action featuring men such as cricket, football, badminton, tennis and rugby among others, for women the sports being broadcast are limited to very few. Take away the most popular sport for women in the world and this situation is not very heartening. It is not known yet if the WTA will partner with some sports’ channel in India to showcase its events in the remainder of the year or in the coming years. For now those who wish to watch women’s tennis on television in India will have to apparently wait for three remaining grandslams, occasional Fed Cup tournaments and very few ITF future tournaments organised and telecasted in India. So with a combination of no WTA events being organised in one of the largest populated countries in the world and no televising of the ones being played all around the world, a grave ‘double fault’ is being committed with regards to women’s tennis in India.